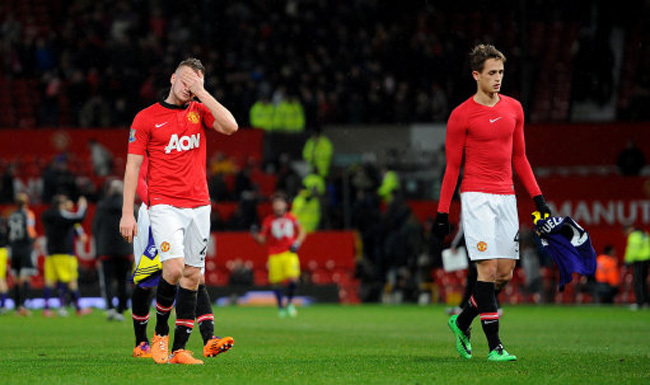 Snapshot: Man Utd Lose Again At Home – Is David Moyes’ Job Still Safe? Yes, it might sound a bit melodramatic, but even when you factor in the natural teething problems at the beginning of a new manager’s tenure, surely Man Utd’s fall from grace, particularly at home, is putting the pressure on David Moyes. With retention of the Premier League title pretty much out of the question, the FA Cup could have provided the Red Devils with a bit of glory this season. However, another limp performance on Sunday saw Swansea winning 2-1, courtesy of a late Wilfried Bony goal. That makes it five defeats at Old Trafford this season for Moyes, including four of United’s last six home fixtures. Surely this is simply not good enough? Or maybe I’m totally wrong (it happens often!) and Moyes simply needs a lot more time and a whole bag of money for transfers. Thoughts? Not good enough? It’s PERFECT. Well, relegation would be fun too. It just shows that the squad is far worse than people thought, and Ferguson’s presence covered up a lot of cracks. After SAF left, it was always going to be somewhat of a ‘poisoned chalice’ for whoever took the job. Utd’s youth system hasn’t produced a crop of top-premier quality for years, the good players were getting old and the dross that was labelled as having ‘potential’ haven’t made the grade. Don’t care what anyone says, on paper that Man U side should be beating Swansea all day long. They’re under performing and it’s a delight to see.